It may come as some surprise, but the shared bike and pedestrian lane that will cross the lake as part of 520 ends at Montlake. 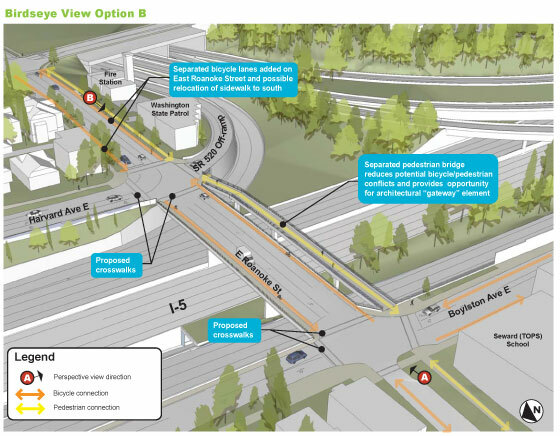 Thanks to neighborhood advocates in the Montlake area, WSDOT is now considering extending this regional bike and pedestrian connection up to the Delmar Lid. 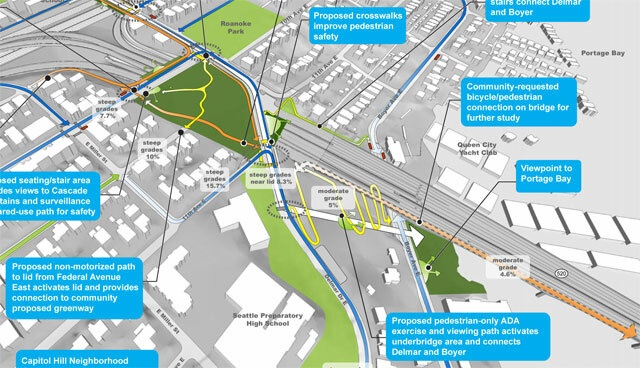 Central Seattle Greenways supports connecting the currently planned bike and pedestrian path to North Capitol Hill via the Portage Bay Bridge. It will create a great new direct connection between our neighborhood, Montlake, the University of Washington, and will tie into a greenways network in Central Seattle, including a possible greenway on Federal Ave. 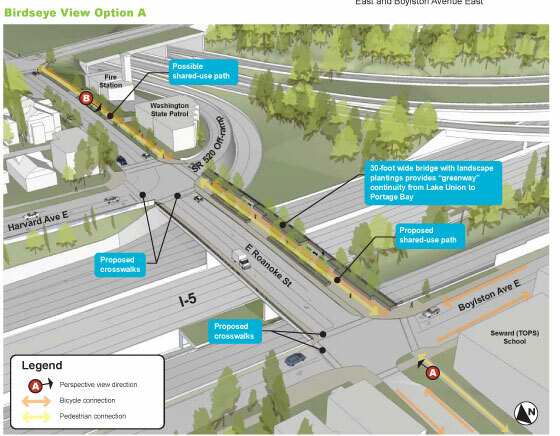 If you support the inclusion of a bike lane on the new Portage Bay Bridge, please let the people at WSDOT know! The next connection is between the water and the top of the Delmar lid. 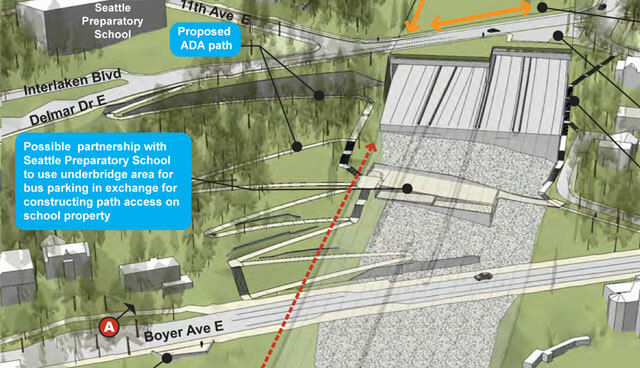 Under the proposal, a piece of land owned by Seattle Preparatory School and the area under the bridge would be used to create an ADA compliant connection (switchback style) between the lid at the top and the street at the bottom. There were two concepts presented, one of which was distinguished with having a sports court underneath the bridge while the other had stairs connection the different levels of the switchback. 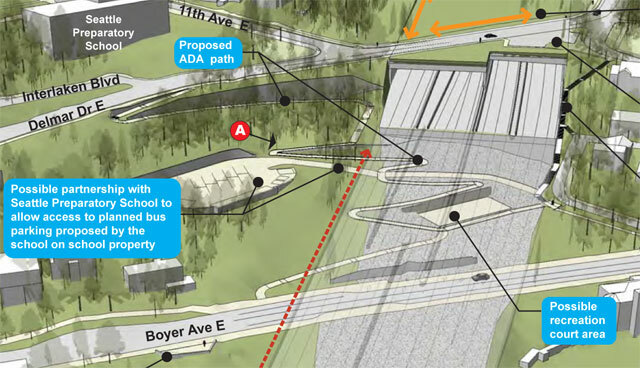 Regardless of which is built (and those of us who were there from Central Seattle Greenways were leaning towards the one with the stairs), this connection will reinforce the Delmar Lid as a hub for active transportation and give people living in First Hill and North Capitol Hill more options on places to go. The final connection that we were interested at the meeting was how to connect the Delmar Lid to Eastlake over I-5. There were two concepts presented, both of which are where the current bridge over I-5 is at East Roanoke. One version has a shared bike and pedestrian path across the bridge with landscaping, while the other had a dedicated pedestrian bridge and then bike lanes on the street. Both would be an improvement over the existing connection and while we were drawn at first to the exclusive bridge for pedestrians, the shared use path would actually create a safer and more enjoyable place for pedestrians and bikes that is more in line with the Neighborhood Greenways concept. 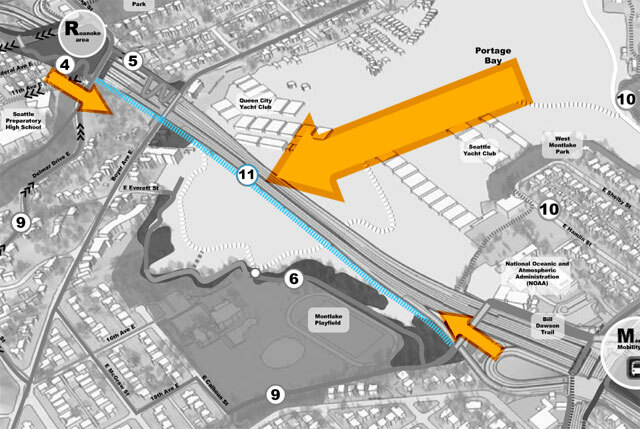 If you’d like to learn more about the Portage Bay bridge replacement and take part at the next meeting, be sure to check out the WSDOT website for the project! You can also see the full PDF of the boards that were presented (and where we got the images for this post) by clicking here. Adobe Acrobat is required.